The recall concerns 2009-2012 Subaru Forrester, 2010-2011 Subaru Legacy, 2010-2011 Subaru Outback, and 2006-2012 Subaru Tribeca models equipped with defective puddle lights. Subaru of America Inc. announced today that it is recalling nearly 634,000 vehicles in the United States for a lighting issue that may lead to smoke or fire. 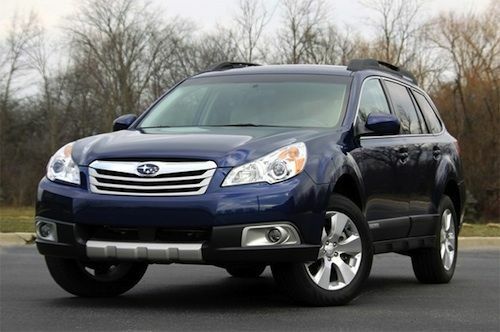 The recall concerns several vehicles including the 2009-2012 Subaru Forrester, 2010-2011 Subaru Legacy, 2010-2011 Subaru Outback, and 2006-2012 Subaru Tribeca, according to the National Highway Traffic Safety Administration. Specifically, the vehicles affected by the safety recall may be equipped with defective puddle light accessories, which are designed to light areas under the doors. Such lights may short circuit when in the presence of a moisture source like road spray. Consequently, the short circuit may generate heat, which can melt the plastic resulting in smoke or fire. Despite the seemingly massive recall, a Subaru spokesman indicated that the recall actually involves approximately 53,999 vehicles equipped with puddle lights. The automaker must recall the wider number of models because it is unsure which cars possess the lights. There have been no accidents or injuries reported related to the issue according to the spokesman. There was one report of smoke. Subaru will begin notifying customers of the recall next month. Dealers will install an additional fused-harness, free of charge, on all affected vehicles. In the meantime, owners may contact Subaru at 1-800-782-2783 for more information. Concerned drivers may also contact the National Highway Traffic Safety Administration Vehicle Safety Hotline at 1-888-327-4236 or go to www.safercar.gov. The NHTSA Campaign ID Number is 12V602000. Thursday’s recall marks the first time an automaker has filed a safety recall with the NHTSA in 2013. Subaru issued two recalls last year beginning with a February recall that involved 381 model-year 2012 Legacy sedans and Outback wagons. The recall, which affected vehicles manufactured between December 1 and December 23, 2011, was issued due to a serious side curtain airbag defect. In March, the automaker issued a sizable recall of 275,000 model-year 2009-2012 Subaru Foresters over a rear seat belt defect. According to the recall documents, certain vehicles contained faulty rear seat belt, which may not securely hold a child seat or restraint. Founded in 1968, Subaru of America (SOA), Inc is the U.S. Marketing and Sales subsidiary of Fuji Heavy Metals, a Japanese transportation conglomerate. SOA is responsible for the distribution, marketing, sales and service of Subaru vehicles in the United States. Subaru’s 2013 lineup currently features the BRZ, Impreza, Impreza WRX, Legacy, Forester, Outback, Tribeca and the all-new XV Crosstrek, which is the most fuel-efficient AWD crossover in America.